L’Artisan Parfumeur is one of the first "niche" perfumeries that won my heart — in a sense, it was the brand that got me seriously interested in perfume, back in the 1990s when my mother was wearing Mûre et Musc and I realized there were fragrance options beyond the perfume counters at the mall. 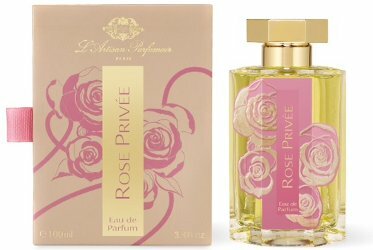 I'm a longtime fan of L'Artisan's two earlier rose fragrances, Drôle de Rose and Voleur de Roses, so I looked forward to trying Rose Privée as soon as it was announced. 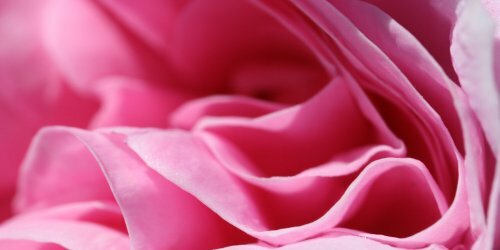 Rose Privée celebrates the "rare and iconic" Rose de Mai of Grasse, and it's a floral fragrance (obviously!) with notes of citrus, black currant, basil and Rose de Mai; carnation, magnolia, violet, and lilac; patchouli and hay. It was developed in collaboration by perfumers Bertrand Duchaufour and Stéphanie Bakouche. It will be released in May, just the right season for a new rose fragrance (and we're getting a few of them this year!). Rose de Mai is a fresh-and-dewy type of rose, rather than a lush rose or a fruity rose, and Rose Privée is true to that inspiration. The fragrance opens on a note of bitter orange with a greenish tinge. The citrus is joined by a tart black currant and an anise-y basil note that's more like basil essential oil rather than fresh basil leaves. There's also something woody-stemmy in the mix. So far, so good — this combination evokes a garden, not a florist's shop. The "private rose" of the fragrance is a very natural-smelling rose located at the heart of the composition. The other floral notes in the list, particularly a powdery lilac and a creamy magnolia, are also very pretty; they don't emerge until the perfume's dry down. Overall, Rose Privée is not as"girly" as you might expect from the pink, rose-festooned packaging. (I have to say that the bottle decal is not quite as pretty in person as it looks in photos.) If you like airy, true-to-life rose fragrances like Annick Goutal's roses, Serge Lutens Sa Majesté La Rose, and Parfumes DelRae Coup de Foudre, you may also love Rose Privée. The base of Rose Privée is reportedly a contemporary update of a classic chypre theme (i.e., oakmoss-free), and it's a bit subdued: the twiggy wood note extends for a while to meet the grassy hay note, continuing the green hints of the fragrance's opening, and the gentle florals blend with a very soft patchouli. I wish the dry down were a little stronger and longer-lasting, but I suppose Rose Privée is intended to be a spring fragrance with a lighter feel. Overall, Rose Privée is less Rose-with-a-capital-R than I expected, but it's also more interesting than I expected. It tells a story, it feels true to its natural inspirations, and it will fit well with L'Artisan's classic collection of fragrances. Bonus reading: for a personal account of a Rose de Mai harvest in Grasse (with beautiful photos), visit this post on Bois de Jasmin. L’Artisan Parfumeur Rose Privée will be available in 50 ($120) and 100 ml ($180) Eau de Parfum. For purchasing information, see the listing for L'Artisan Parfumeur under Perfume Houses. Note: top image is Layers of pink petals [cropped] by Quinn Dombrowski at flickr; some rights reserved. Yay a review of a fragrance I’m very eager to try. You make it sound very lovely. I too love Drôle de Rose but am less fond of Voleur. A pity about the bottle, it looks ok in pictures. I love both Drôle de Rose and Voleur de Roses, but they are so different from one another, of course! Drôle de Rose is so pretty, all violets and rosebuds, and Voleur is so earthy. It does not sound hyper-realistic like jo Malone’s Red Rose, but does sound fascinating! What is the silage and lasting power like? It’s funny — I’m not a big fan of Jo Malone Red Roses, maybe because it smells just like a bouquet of cut red roses, and I prefer something a little more fresh-picked? I’m not sure! I think the sillage and staying power are both medium here; sometimes it lasts longer than other times, but it’s not a powerhouse of longevity. Ok, thank you! L’Artisan often fades quickly on me which is why I was wondering. Rose, magnolia, and basil–how could I resist? Tempted to buy myself a bottle unsniffed for my 60th birthday in May. Hopefully I can restrain myself until I’ve sampled. Oh no! Never Buy Unsniffed. I’m hoping that samples won’t be hard to find, once the bottles are shipped to retailers. Sounds like a nice addition to a historic sea of rose near-soliflores. I’m always interested in something new from L’Artisan, and I’ve been curious to see what Bakouche and Duchaufour have come up with. Well, there’s no incensey note in this fragrance, so it doesn’t seem like a signature Duchaufour! I had the opportunity to hear S Bakouche speak at a launch event, and she seemed lovely and so knowledgeable. Oh my goodness! This is a must-try for me. Rose, basil, lilac, magnolia: it sounds just wonderful. My current favorite rose is Goutal’s Rose Absolue, and I also like Drole de Rose. Can’t wait until Rose Privee comes out! I think you might like it! There’s a true rose in it, but the overall effect isn’t flowery-sweet. I’m guessing Barneys and Aedes will carry it in May! Roses are hit or miss with me. I’d have to sample this but I think the longevity might be an issue. Yes, I do wish it lasted longer on me. Then again, others might have better luck. Sometimes I feel as though my skin just soaks up most perfumes! This sounds really interesting. I am slowly but surely becoming a fan of L’Artisan with Amour Nocturne being my favorite. I am not a huge fan of rose scents, but this one seems to be one that won’t be so overpowering. I am always willing to try something new, so like CobraRose , in May (my bday as well) I will be excited to see what this one is all about. SFA, it’s definitely not the rosiest rose perfume out there — the green and woody notes balance it out nicely. I hope you’ll give it a try if you can! Nice review. Hopefully I get a chance to try this at some point. Actually, I really ought to try a few from your top 25 list. Rose perfumes aren’t something I’d necessarily wear (although I have warmed to my sample of L’Ombre Dan’s L’Eau) but they’re such a pleasure to smell all the same. Also, I’m wondering if you’ve seen this yet. These won’t be released for a while but I thought the ultraviolet bubble bar might catch your interest (I remember you once mentioned an old favorite called bathos that had been scrapped). Hmm…. this does sound very interesting and definitely worth a try (especially since I don’t see the dreaded white musk in the notes!). I too own and wear Voleur de Roses but I never can find the rose in that one – it’s all patch and plum on my skin. Not complaining though. Great review! Thank you, Jessica. Do give it a sniff if you have a chance! and now, no white musk. No pink pepper or oud, either. Thanks for the scoop on this one, Jessica! I’m not sure it will prove rosy enough for my current taste — I’ve been wearing Drole de Rose almost daily — but I’m looking forward to finding out. And I’m glad to hear there are more new rose fragrances to look forward to! Hello! You might like it — at least, I think you might. I’ll bring you a bit next time I see you!